Ginni Rommetty is IBM’s first female CEO. The supercomputer Watson, famous for beating top champions on Jeopardy! In 2011, is making headlines again, this time being heralded by its boss, Ginni Rometty. Rometty tells the media to prepare to see Watson help your doctor diagnose your ailments, help companies make major financial decisions and formulate for pharmaceuticals. As the world becomes more complex, Rometty says, computers will need to know how to learn on their own. Watson has already been able to absorb all available research on cancer and is being trained to advise oncologists. As Watson becomes more reliable and continues to improve, Rometty insists historians will look back on our time as the Golden Era of Technology. Other than championing the latest supercomputer, Ginni Rometty is a financial and business powerhouse. A program she created for her last role in marketing and strategy will account for nearly 30% of company revenue by 2015. 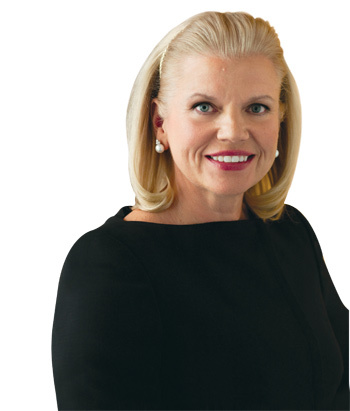 She has been with IBM since 1981 and has held various roles in executive leadership. She is the company’s first female CEO. Innovation is her biggest message as the face of her company, telling shareholders that the company is ever changing and on the edge of the future. One example she gave recently was that IBM leads the United States in earning patents, with a record number of patents in 2012—over 6,000. Rometty and her company are investing billions of dollars in cloud computing and analytics tools, and she believes that value in business is moving from the top down controlled model of sharing information to a model that values open sharing and community perception. Online social savvy will be similar to what factory production lines were in the past. She is number 15 of Forbes’ list of Power Women, and will definitely continue to be a force to be reckoned with in her role as CEO in the years to come.